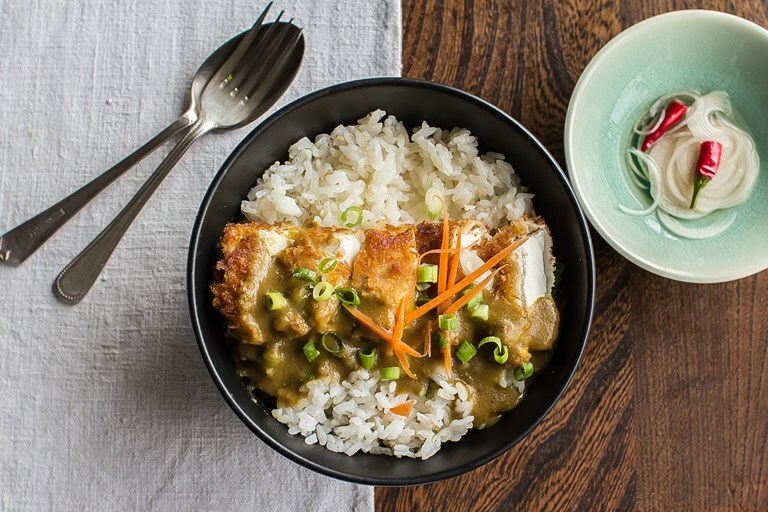 This sublime tofu katsu curry recipe offers a vegetarian version of this classic Japanese dish, usually made with crispy chicken breast or pork. With a mildly spiced and creamy curry sauce, this dish makes a fantastic comfort food recipe to warm the cockles on a chilly night. What differentiates Japanese curry from other curries around the world is the cooking method, sweeter taste and creaminess. It all starts with a flour and butter paste (a basis for white sauce in western cooking) and the end result is a creamy, thick curry sauce. Curry was introduced to Japan by the British during the Meiji era (1868–1912) when India was under the colonial rule of British Raj and Japan opened its doors to foreigners and their goods. 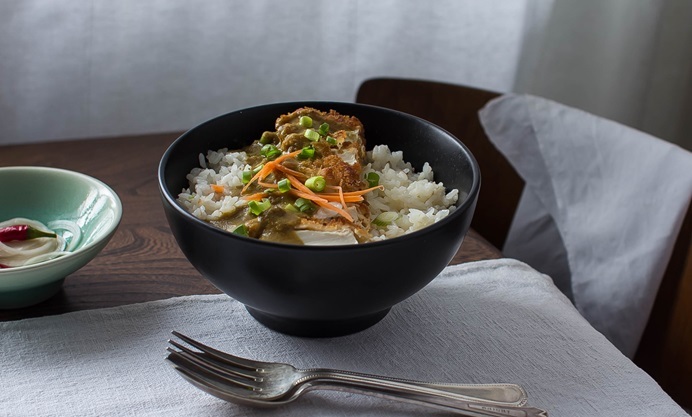 The dish became well-liked in Japanese homes after the development of instant curry mix powder in the early twentieth century, and demand took off after World War II when curry roux in cubes was introduced. The dish was then available for purchase in supermarkets and on restaurant menus in the late 1960s. There are a wide variety of vegetables and meats used to make Japanese curry. The main vegetables are onions, carrots and potatoes, with beef, pork, and chicken the most popular accompaniments. The easy preparation and the vast variety and availability of curry mixes has made curry accessible in the home kitchen, as it is very easy to make compared to many other more intricate Japanese dishes. Here is a vegetarian version using tofu.